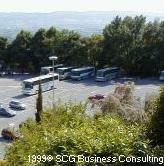 The MOJANO Assisi Parking is spread over three levels plus a level for services and the shopping mall. The rectangular design of the parking covers a gross area of 3000 sqm., with each level offering roughly 100 parking places for a total capacity of 299 places. The basement LEVEL ONE holds 95 parked cars, while LEVEL TWO has a capacity of 102 places and the THIRD LEVEL ENTRANCE and EXIT POINT can hold a total of 102 parked cars. - a shopping mall covering an area of 235 sqm., with the bar il MOJANO Cafè for pizza and the MOJANO Shopping Gallery with a range of typical local produce, souvenirs, tourist guides and other goods, etc.